In brief: Like it or not, Windows 10 is now a "live service" - it receives regular feature updates for a single upfront fee (though that may change later). One such upcoming feature is "Microsoft Search," which will cause Windows 10's (and other Microsoft services) search window to merge results from Office 365, Outlook, Bing, and more. Whether you love it or hate it, Windows 10 is the go-to operating system for many PC enthusiasts, professionals, and gamers throughout the US. Though not everyone will agree with all of Microsoft's latest decisions -- such as "warning" users against using browsers other than Edge -- many of the changes the software giant has made to Windows 10 have been positive. The OS is easier to use and arguably more private than it's ever been; particularly now that users can turn off many (but not all) of Microsoft's built-in telemetry "features." However, one upcoming feature update might prove slightly controversial. Starting today, Microsoft is launching the aptly-named "Microsoft Search" feature. 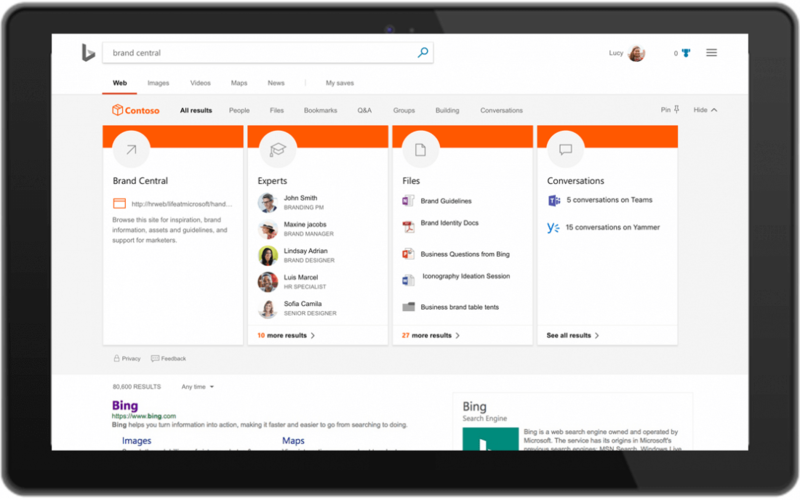 Microsoft Search is an AI-powered, personalized "search and discovery [experience]" that will combine search results from Office 365, Bing, and Windows 10. No matter where you search, Microsoft wants you to have the "same experience." For example, if you search for "resume" in Bing, you might see resume template results from the web, as well as resume document results from Windows 10 or Office 365. Search will also learn from its users over time, and adapt to the way they work. For example, simply clicking on the search box in Windows 10 could instantly show you contacts you frequently share files with. In theory, this sounds like a neat idea, but in practice, I'm not so sure. Though this search functionality is not exclusive to Windows 10, its users might be the least receptive to a change like this. When I'm on my own personal PC and I begin searching for something, I expect to see files on my machine, not Bing results, Outlook emails, or Office.com documents. If I wanted to browse the web, I'd use a web browser, and if I wanted to read my emails, I'd open my email client of choice. Right now, search results can be filtered in Windows 10 by clicking the "Apps," "Files," or "Web" buttons. However, the upcoming changes to Search could make the process a bit more complicated. With that said, only time will tell how exactly these features will work. Though this feature rollout is beginning today, it will only launch for Bing, Outlook, SharePoint, and Office.com users initially. It won't arrive for Windows 10 users until the first half of 2019.